An user-friendly graphic designing software. 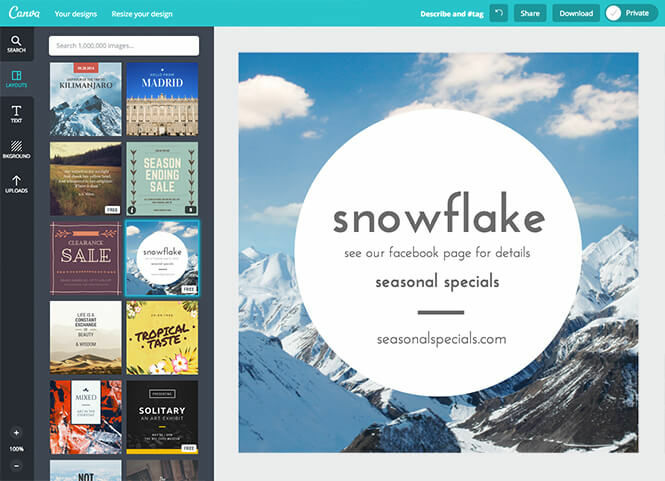 Canva offers a simple design platform for users to create quality graphic designs. This online design application has simple drag and drop tool which makes designing easy for the users. It has around 8000 default templates that you can use to create appealing designs. It also allows you to create custom designs that holds your brand name. In addition, this software supports configuration and collaboration using which designs can be viewed and modified by multiple users. 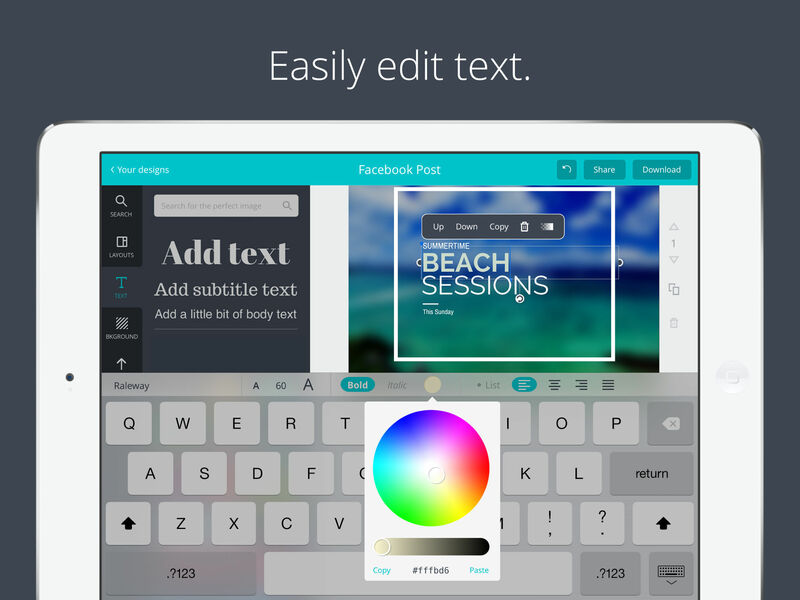 It is an user-friendly application with millions of texts and fonts that you can use in order to create presentations and social media graphics. How much does Canva cost ? 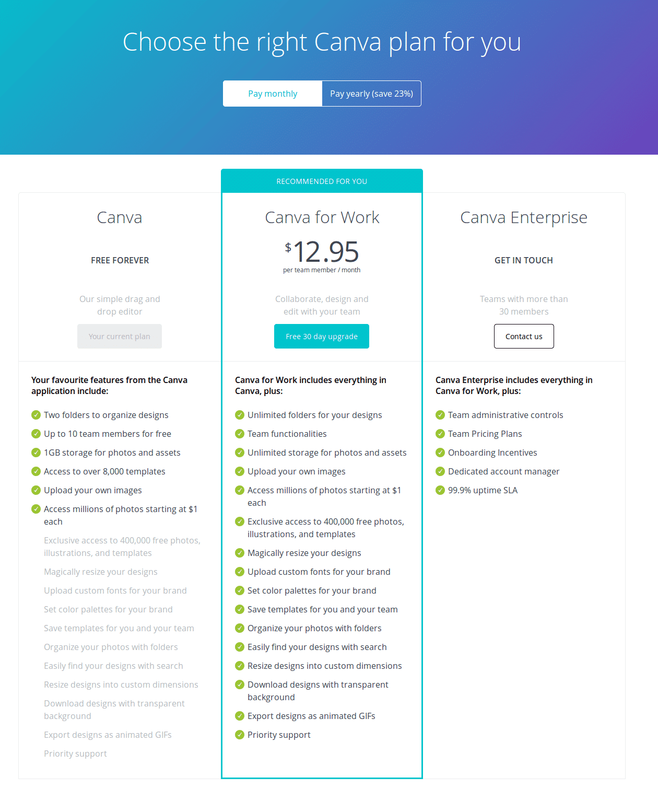 The pricing for Canva starts at $12.95 per month. 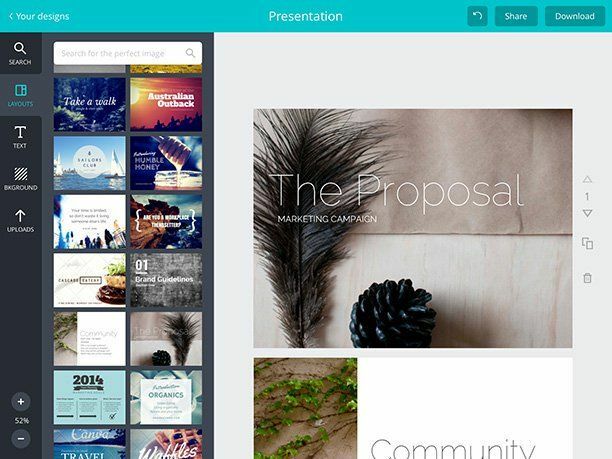 Canva has a single plan - Canva for Work at $12.95 per month. 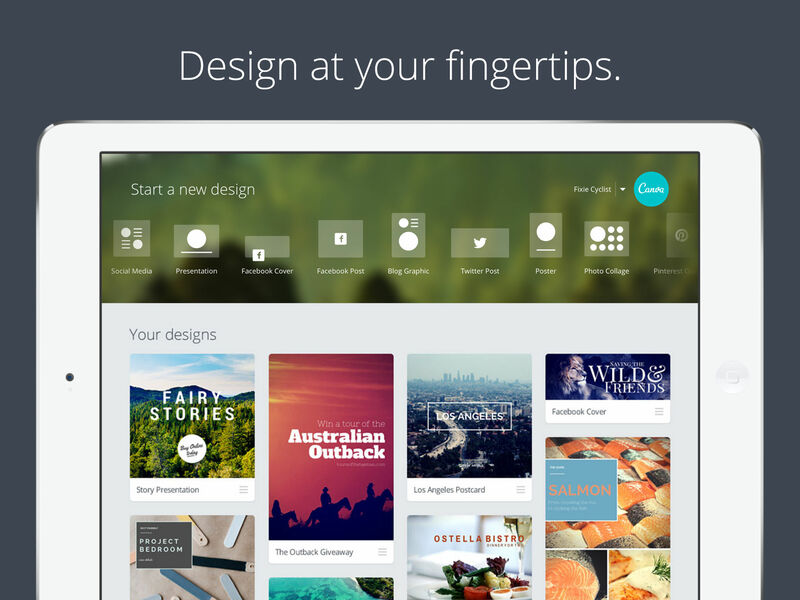 Canva offers a Free Plan with limited features. They also offer an Enterprise Plan for their product. Have to Contact the Organization for further Details. 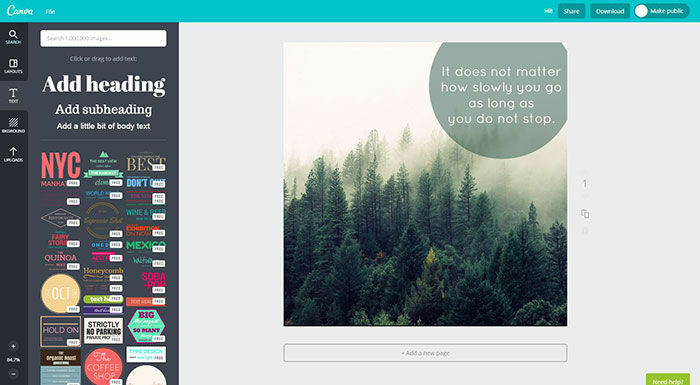 Pros: What I love most about using Canva that they have templates available and all left to do is edit them. You don't have to be a graphic designer to create nice looking graphics. We use it each week. Cons: I'd like to place on my Canva wish list for them to add a feature to be able to add a shadow behind the text. Sometimes a hint of shadow would help. Overall: This is a really great graphic design option for anyone who may not think they have the talent, time or software. Pros: I love that this tool is free to use! Primarily useful for social media graphics, Canva is also great for designing printable flyers and posters in standard paper sizes. The platform provides blank template optimized for most social media dimensions (Facebook cover photos, events photos; Instagram Post and Story; etc) The Pro "Canva for Work" version allows "magic resizing" of one design into other dimensions without needing to remake the entire layout from scratch each time, as well as other useful features for non-designers or designers who want a simpler way to create quick graphics! Cons: The free trail is 30 days, but does require a credit card which is common but not very reassuring to many users and freelancers with very tight budgets. 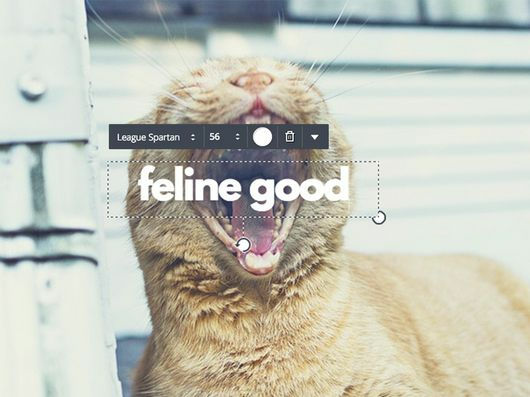 While Canva has a great library of elements such as stock photos from Unsplash and graphic symbols, most of them are for purchase or only available with the pro/premium account. Overall: I have used Canva for several years now as an experienced designer. For me, the free version is just fine since I'm able to switch to Adobe Creative Suite for more complex jobs requiring more features. 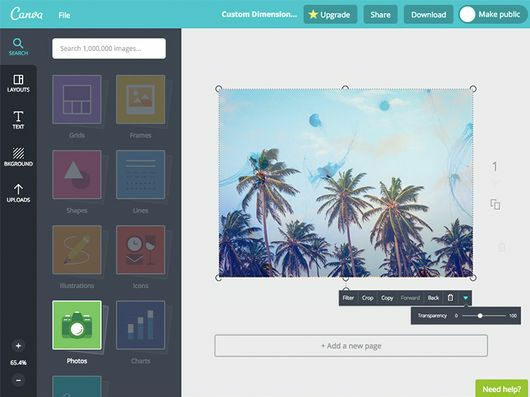 Canva for Work would be a great tool for someone who doesn't need all the bells and whistles of Photoshop or Illustrator. 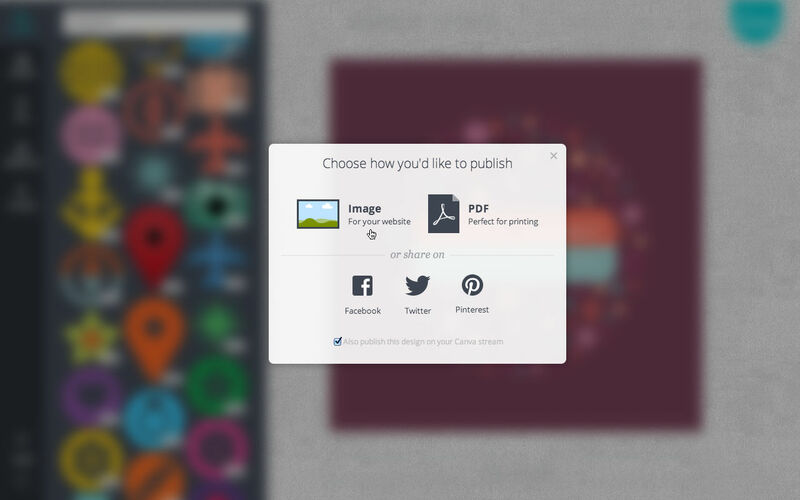 Definitely get a free account for social media asset creation! Pros: This is one of the best products for quickly and easily producing professional images. The tempates (even the free ones) are great and offer a huge variety as you create the images you need. Also allows for colors, fonts, and images to be saved as part of your company branding. Cons: There are times where I want to use existing elements from a particular image I created on a different image. While you can copy and paste somewhat, I would like to be able to easy copy and paste from one internet tap to another. Look credible and be helpful to your customers with Canva Infographics! Pros: Canva makes it super-easy to create an infographic just like the ones you see on your favorite blogs, Pinterest posts, etc.! My partner uses Canva all the time for her psychology blog, making her posts on social media extra helpful for conveying her message and oh-so-clickable! There is a wealth of free graphics, tools, etc,and you can pay a la carte to unlock way, way more. I personally use Canva to create clear, image-based House Guides for my AirBnB listings. I just export to PDF, upload to google drive, and link to the guide in my check-in messages. Cons: It takes some tinkering to figure out the interface, especially if you don't have experience doing this type of graphic design. My instincts from using Adobe Illustrator in the past helped me, but your mileage may vary. 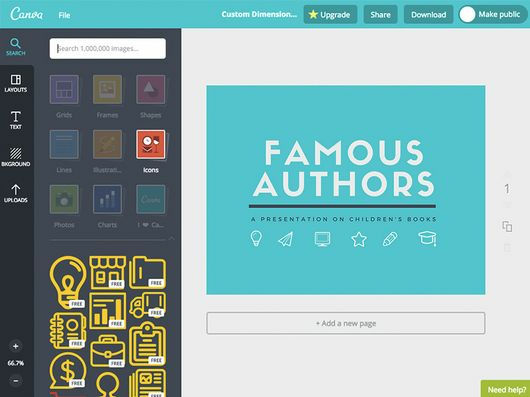 And yes, it's true that to fully unlock alllll the best content on Canva, you will be tempted to spend some money on images, etc. But you don't have to! Overall: Canva makes me look professional and genuinely helps me help my customers, and the cost, if any, is negligible. I'll continue to use it! Pros: The tool is versatile, and the features provided for free users are adequate. The templates are engaging and offer great variety. Easy to put together materials for campaigns, or even personal use like baby shower invites. Cons: We use Canva for a student organization with no budget, and it's challenging that some features are not available to users who don't subscribe. I realize it's a business that must make money, but I wish there was a heavily discounted version, or that they partnered with universities to offer free use to students. 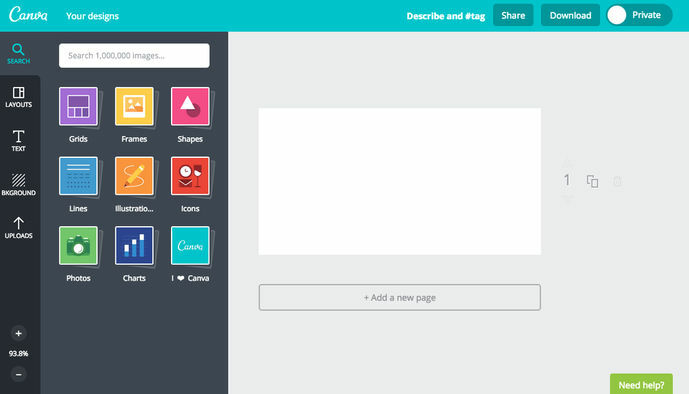 Pros: Canva is a useful tool to make presentations and design various UIs . 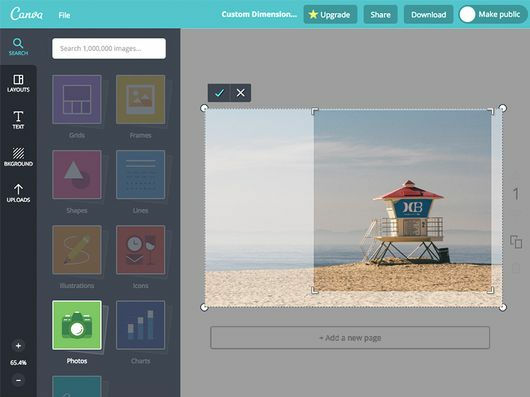 There are variety of drag and drop widgets and Pictures that could be inserted through Canva, this enables the user Portray his innovative Ideas in to action. The usres will have the benefit of making the design from scratch where they can use brand name and logos of the selected company. We can make UIs and also power points to show the features that would be in the actual web Portal we are going to develop. So this would increase business opportunities. This tool can be downloaded through Webiste for computer or else it can be simply downloaded through Mobile App, which is very Convenient. Cons: It would be more convincing if they give the opportunity to embed Videos and GIFs. Organizing the Images would take some time. If you click the Undo Button it will not be going to, what i did last instead it would go to the very beginning. It is also a bit difficult to Edit Graphs and Charts on Canva. 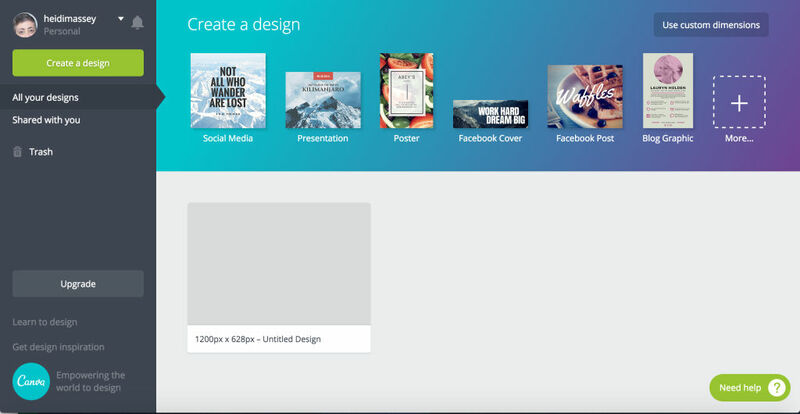 Overall: Canva is used to do Presentations and to create Prototype graphical Interfaces to show a sample of how the actual web Portal would like, If Clients are convinced then there would be more business Opportunities and this would increase the revenue of the Organisation. It is a easy tool to use where can be used by beginners as well as also Graphic design professionals. Pros: This software is totally user freindly and easy to use even if you are somewhat technically challenged. Most of all it is affordable for a small business user. It also produces quality products. Overall: It has solved the issue with being able to give our volunteers & employees a free platform that produces professional results. Pros: Canva is easy to use, intuitive, and has a lot of different features even at the free level, which means you can make almost any graphic your hear desires. Plus, working with Canva makes the work of basic graphic design super fast. Cons: Every once in a while, I find a feature that feels somewhat NOT user friendly, or a little less intuitive. I've also experienced issues with functionality when using it with different broswers. Pros: Canva offers so many gorgeous template and presentation elements, many of them free of charge. Cons: Just because there are so many customization options, I wish there was a "favorites" section or a better way to sort/filter/find the options that you're looking for. 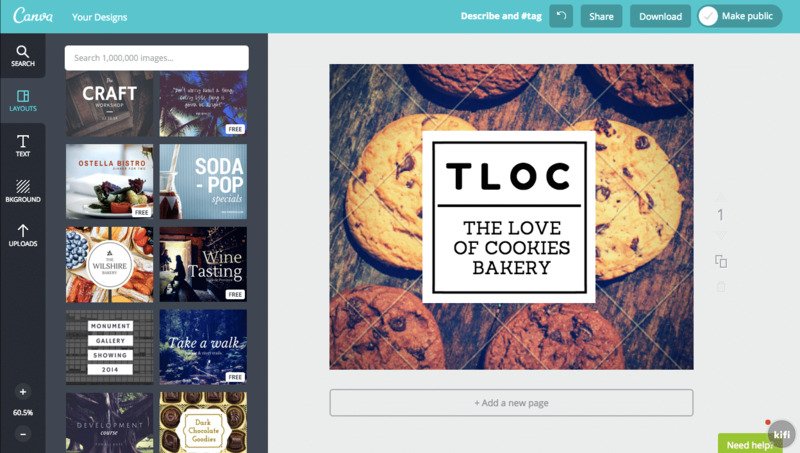 Overall: I use Canva on a weekly/biweekly basis to present during meetings. It allows me to present my insights in a clean, professional, yet creative and visually pleasing format. Pros: I love that Canva enables me to make fun and professional designs, while making the process super simple. It's very manageable to navigate and use. Cons: The paid features are mixed in with the free features, and it's a little confusing. I wish that they were more separated so that I know what I need to get approval for. Overall: It's been really positive! I have definitely enjoyed being on the Canva site. Which is the most user-friendly graphic design software suitable for beginners? 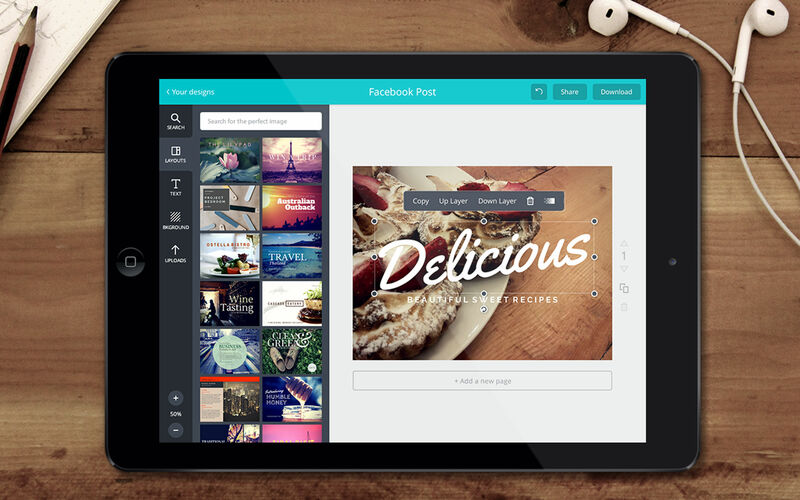 Canva is the most user-friendly software when it comes to beginners.